Did you know that the gas turbine technology is the most popular for power generation? When you look back through history, it immediately becomes clear that the experimental stage of this technology was present as early as the 1900s. Although the first turbines were meant for airplanes, 1939 saw the introduction of the first gas turbine-based electrical power system. Thanks to research and development, the economic benefits and reliability of the gas turbine are unrivaled. But what is the gas turbine theory behind this powerful machine applied in aviation, industry and other settings? The following discussion is meant to help people who are new to this equipment have a basic grasp of its components, operation and power increase. If you are looking towards purchasing a gas turbine or are simply interested in learning more about the ones you already own, this post will prepare you for a more candid discussion with the supplier or manufacturer and help you learn the basics of gas turbine theory. The turbine may be lightweight and compact, but it comprises at least three major components: compressor, turbine and combustion chamber. The compressor raises the pressure of the combustion air, the turbine extracts energy from the gases and combustion chamber is for burning the fuel/air mixture. According to the gas turbine theory, the work of this equipment is to convert fuels such as natural gas to mechanical energy. This energy drives a generator for the production of electrical power. It all starts with the ambient air entering the compressor. The compressor increases the temperature and pressure of the air, before directing the transformed air to the combustion chamber. Here, the air-fuel mixture is heated at elevated pressures and temperatures (over 2000° F) to create an extremely hot gas. This gas goes through the turbine blades accelerating them to an incredibly fast rotation. In other words, it creates work that makes the drive shaft to spin furiously. This process produces electricity that can be fed to the grid. This is what is called an open Brayton Thermodynamic Cycle. Several things can affect turbine efficiency, including waste heat. This problem can be handled with a recuperator, a system that recovers energy from the exhaust. That aside, one of the biggest breakthroughs in turbine power is overcoming temperature limitations regarding ambient inlet air. The ideal (ISO) conditions for the operation of a gas turbine are 60 % relative humidity and 15° C. Operation may dwindle if the ambient temperature is higher than ISO temperature. This is a common problem in hot climates, where the ambient temperature is normally in the excess of 30° C. The result is reduced output of the turbine and a change in properties of exhaust gases. 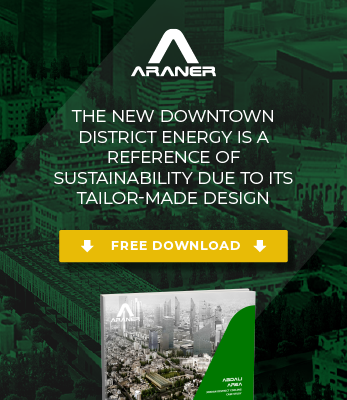 ARANER has developed TESTIAC, which is a popular combination of Turbine Inlet Air Cooling Technology (TIAC) and Thermal Energy Storage (TES), to address this issue. Thanks to emergence of solutions of this manner and development of better turbine materials, turbine power capability has gone a notch higher. Maybe you are wondering how long it takes to create such a system. Another advantage of TIAC is the short delivery time, making this technology perfect for rush power increase needs. Designing and optimizing a turbine inlet air cooling system is an exhaustive process. This is because, together with the basics of gas turbine theory, ambient conditions have to be studied. Furthermore, a lot of variables play a key role in the process: air temperature after cooling, chilled water temperature, condensation method. ARANER experience and in house-developed simulation tools can support you in the TIAC system optimization. For many years, the emphasis has always been on turbine long life, leaving the need for performance unattended. With the emergence and adoption of the turbine inlet air cooling technologies, performance of gas turbines is now something facility owners can improve. The role of cooling technologies is to increase flow rate of combustion air in the compressor. Since the volumetric capacity of most turbines is fixed, the only way to increase mass flow rate is increasing air density. ARANER’s TESTIAC system helps increase air density. This not only increases the power produced by the turbine, but also reduces fuel consumption rate per unit watt. What more intervention could you ask for as power plant owner or manager? Natural gas is still the preferred fuel for many power plants, meaning that the need for gas turbines is not about to subside. If you are looking for a gas turbine or are simply interested in this complex machine, the information shared here should help you get into the market with more confidence. Contact ARANER for more information about gas turbines and their power increase options or download your free copy of our Turbine Inlet Air Cooling Reference Book.